So who remembers Houseparty? Daytime TV show from the 1970s, reality TV before reality TV existed, fly-on-the-wall kind of thing, ahead of its time. Featuring a group of friends (‘housewives’) gathered round a table talking about – whatever. Often with cooking. Well, Xavier de Sousa’s Post is a bit like that, except that the people gathered around his table are strangers rather than friends. But isn’t every stranger just a friend you haven’t yet met? The food is a star player in this show – and smell, touch, and taste are as much a part of the dramaturgy as the usual elements of sight and sound. There is the sizzle, the smoke, then the smell of charred chorizo; the invitation to nibble on sweet bread and tiny olives; and a tray full of throat-burning cachaça shots passed through the audience, who stand for a toast – ‘up, down, to the left, to the right, to the crotch, to the sky – SAUDE!’. But best of all – the crowning glory – is the caldo verde. This, we learn, is Portugal’s national dish, a delicious soup of green vegetables, garlic and onion. It would normally have the chorizo in it too, but this is kept separate, in a spirit of inclusion, so that everyone in the room – carnivores and vegetarians alike – can get at least a taste of this magnificent brew. 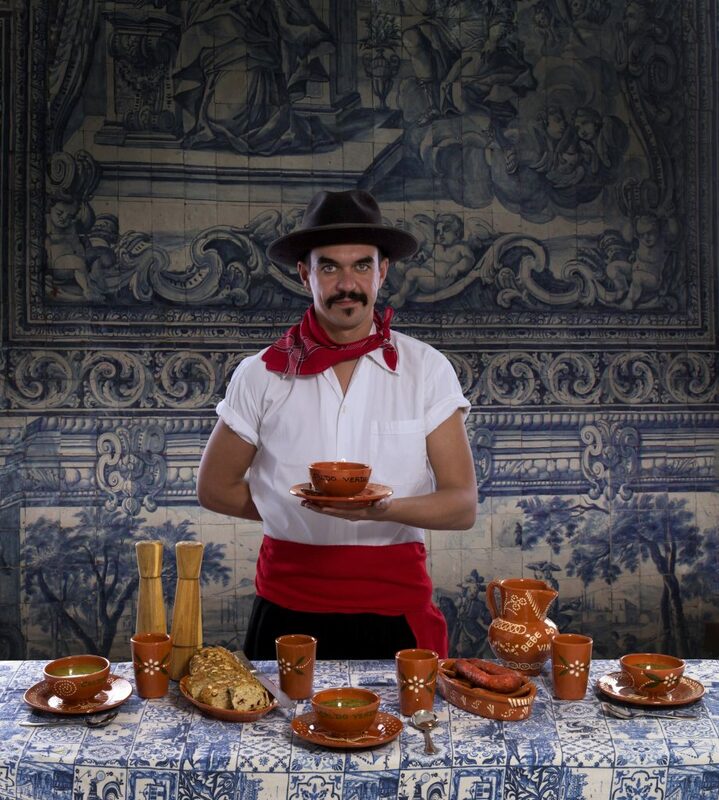 Xavi has added a dash of paprika to mimic the smokey chorizo taste… So right here in the onstage making and eating of this soup are three of the central themes of Post: cultural identity, inclusion and hospitality. But let’s backtrack a bit. We arrive in the space – a regular theatre set-up, end-on, with tiered seating – to see our host already in action, dressed in black trousers and overskirt, a red cumberband and a white shirt, sporting a handsome moustache and a rakish black felt hat. A folkloric 3/4 tune plays repeatedly as he spins across the performance space, gracefully avoiding the big wooden table centre-stage. Once we are all in our seats, he stops the dance, and welcomes us in with a personal introduction. We are told that he is from the Coimbra region in Portugal, moving to London thirteen years ago to experience the freedom of a queer-friendly city, working (as immigrants often do) as a waiter, then establishing himself as an artist and producer, and moving to Brighton. We are invited to learn how to pronounce his name. This moves into some gentle one-on-one questioning: Where do you live? Where are you from? What does ‘home’ mean to you? Are you a good host? He shifts into a less prosaic, more poetic performance mode, sitting at the table with a book, reflecting on family heritage, Portugal’s seafaring history, colonialism, and the burden of being a descendant of people who were complicit in the slavery of other human beings. Back to the direct address to individual audience members: the man sitting next to me is called João, and he comes from Porto – like Xavi, he left Portugal around thirteen years ago. Further back in the auditorium is a British-born man of Indian heritage called Ash. A woman called Silvia moved to the UK from Italy, and she has now – just in the past few weeks – acquired a British passport. Marty is from Essex, with a complicated working class family background. These four end up around the onstage table – and prove to be a gift to any artist co-creating a show with their audience. Xavi serves them food, and discretely passes them brown envelopes containing questions to keep the dinner party conversation buzzing, whilst also keeping us included in the action by ferrying out bowls of soup, forkfuls of chorizo, and refills of cachaça. The dinner guests at the table hardly need the envelopes: the conversation flows along with the vinho verde. But the prompts keep the talk focused around the themes of the show: migration, integration, and what it means to be British; living in the limbo of non-conformity as ‘other’; and what it is that makes us a nation. Ash talks about the pressures of being part of a higher-caste Hindu family, delights us with saucy stories about gay clubs in the 1980s (‘I’m younger than I look’), and tells us that Freddie Mercury’s mum – Jer Bulsara – is a family friend, although it took him years to realise that her son Farrokh was the lead singer of Queen, as most in his community are rather dismissive of the Bulsara boy’s choice to become a rock singer. João is the epitome of reasonableness – diffusing a choleric argument about the pressures of ‘fitting in’ to the host country, and working hard to understand and articulate the conflicting needs of different groups in society. Silvia doesn’t often push herself forward – I wonder if the men at the table notice that she hasn’t spoken for a while? – and when she does join in, she often plays the role of the ‘good immigrant’ who has done all she can to dutifully fit in to British society. Marty is the only one at the table who is neither an immigrant nor the child of immigrants – but he realises that his experiences of ostracisation, of the ‘otherness’ of being a gay man brought up in a working class outer-London community, was analogous to the others’ experiences in ‘failing to adhere to border and identity-defining norms’. And all the while, the wine flows, the soup cauldron empties, and our generous host looks out for all our needs whilst merging more and more into the background (often leaving the stage completely, or sitting quietly at the back). Post is a beautifully structured and lovingly enacted performance piece – the combination of shared food and drink, reflection on cultural heritage, and the respectful agency given to the carefully chosen co-creators, is a winning recipe. Autobiography and identity are the base ingredients, but teased out to become something far more universal and far-reaching than one person’s story – it’s about all of us. Seeing the show as part of BAC’s Homegrown:Occupy season, it seems to perfectly epitomise the building’s motto: Non Mihi, Non Tibi, Sed Nobis. Not for me, not for you, but for us. A veritable feast of a show that leaves you with a warm glow (and not just from all the cachaça). Featured image (top): Xavier de Sousa: Post. Photo by David Pickens Photography. Homegrown Festival is BAC’s annual building takeover, amplifying young and underrepresented voices. Homegrown: Occupy runs 18 March–12 April 2019 and is curated by Saad-Edine Said.